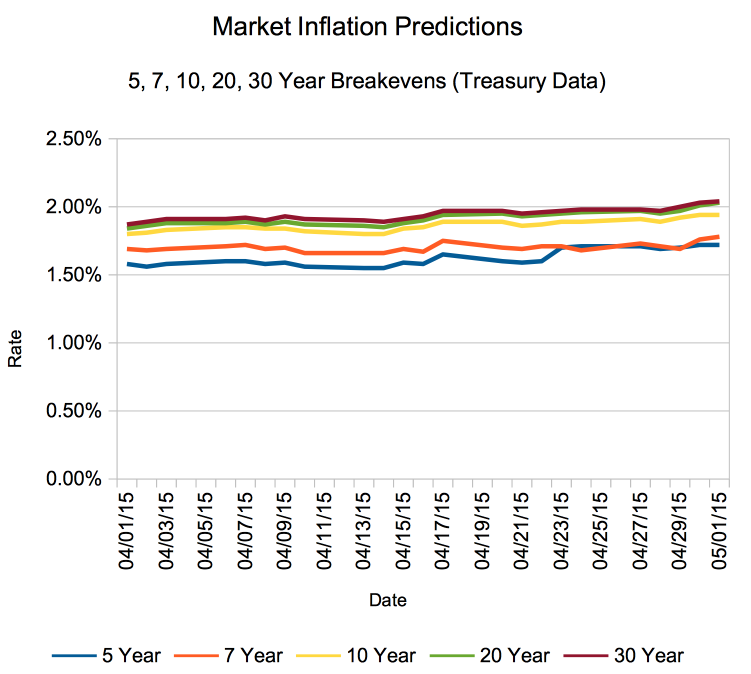 One of the interesting things you can do with Treasury yield data is get a feel for what the markets expects to see in terms of inflation over the next thirty years or so. By subtracting real (read: after inflation) yields on inflation protected securities from the yield on non inflation protected securities, you can see the premium suggested for the inflation component – that component is the annualized rate of inflation expected by the market. This revelation isn’t a new theme on the site – we’ve visited it often, and we even have a calculator which automatically calculates various inflation premium breakeven rates for you (of course we do, right?). However, we like to revisit the math whenever we start to see something ‘interesting’ happening – and interesting is how to best describe the recent data. We’ll explain. That’s right – in the last week, the market started pricing in over 2% inflation over the next 20-30 years (for the first time since November of last year). This started before the statement on the 29th, too, mind you. Now, as we’ve mentioned before, this is just a rough cut at market expectations – the Federal Reserve (and economists elsewhere) note that this data isn’t entirely accurate because of various reasons. The Federal Reserve has its own various measures of inflation expectations – some examples being a survey of forecasters at the Philadelphia Fed, inflation ‘nowcasting’ at the Cleveland Fed, and business inflation expectations at the Atlanta Fed. Keep that in mind before putting your complete trust and faith in the numbers, but note that they are a very good rough cut and instant feedback for your own planning purposes. We’ll have an example of one practical application for these inflation expectations in your own finances – evaluation of various forms of credit (we’ll look at mortgages and car loans) later this week. When do you think the FED will raise its interest rates ? Some analysts say it will happen in June but I’m confident the FED will act in September. I’d say maybe September at the earliest – but I’m not that into the prediction game, so don’t weight my estimate that highly!